Export Information - Where in the World? 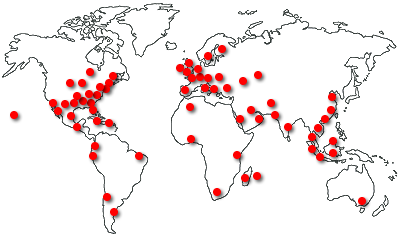 NoiseMeters exports to almost any part of the world. Delivery is calculated during the order process (once your location is known) and presented to you before you actually place your order. For more information visit our Delivery Charges information page. Duty and any local taxes that may be due are not included. The NoiseMeters web sites present the prices in £ (GBP), $ (USD), € (Euro), Canadian dollars (CAD) and Australian Dollars (AUD). For a quotation in any other currency please just send an email to sales@noisemeters.com stating your needs. Please visit the most suitable Regional NoiseMeters Web Site page. To ensure a quick service, good tracking and efficient clearance through Customs, we usually ship using the FedEx Express service. For some regions we use DHL or EMS (for lower cost items). For meters that are in stock (shown on the product's web page) the delivery time is usually three to five days from order, including Customs clearance. For most regions we use FedEx to clear the goods through Customs. FedEx will contact you directly when the goods arrive in your country to make the arrangements. Which Countries Do We Supply? NoiseMeters ships from our warehouses in the UK and in the USA to almost any part of the world, limited only by the ability of the shipping companies. We have not yet found a country or region that we have been unable to deliver to. Our web sites present the prices in US Dollars, Canadian Dollars, Euros, Australian Dollars and British Pounds. We can accept credit card payments in these currencies. Please contact us if you would like a quotation in your currency for payment by bank transfer or cheque. Credit Card - We accept payment for online orders by credit card (VISA and MasterCard). Bank Transfer or Cheque - Advance payment by bank transfer or cheque is accepted in most currencies. Please contact us for a quotation, which will include all the payment details. Import duty may be payable if you are outside the USA and outside Europe. FedEx will contact you when the goods arrive in your country to collect the payment. Delivery Duty Paid - For some regions we offer a complete door to door service with all duty and taxes paid. Please contact us for more information and a full quotation. Our delivery charges are very competitive, despite the use of express services. For online orders the exact charge is calculated before you finish the order. Please visit our Delivery Charges page for more information. Noise Meters supplies sound level meters and noise dosemeters for noise at work and environmental noise monitoring throughout Australia. We also supply noise warning signs for industry, hospitals, neonatal units and the entertainment industry - hotels, pubs, clubs, nightclubs. We can accept payment for sound level meters by credit card (VISA or MasterCard), cheque or bank transfer. Large companies, hospitals and similar establishments can usually have an account with the usual 30-day payment terms. Delivery within Australia is $40.00 for a Sound Level Meter, more for larger items. A full list of delivery charges is available on the Australian Sound Level Meter web site. Most sales and technical support is carried out from our USA office in Michigan. Delivery within Canada is $40.00 for a Sound Level Meter, more for larger items. A full list of delivery charges is available on the Canadian Sound Level Meter web site. NoiseMeters Ghana supplies a large range of sound level meters, noise dosimeters and environmental noise monitoring systems to customers throughout Ghana and neighboring regions. The prices on the website are all in US Dollars, but we are happy to work in other currencies too. These prices do not include delivery (see below). Payment can be made by credit card, cheque or bank transfer. The full list of delivery charges can be seen on the Delivery Charges page. When shipped by FedEx or DHL, the charge for a Sound Level Meter is USD $82 and for a Noise Measurement Kit (meter, calibrator, carrying case, etc.) is USD $98. Shipping by EMS of the lower cost sound level meters, such as the NM102, is just USD $41. The prices and delivery charges do not include any import duty or local taxes that may be due. A door-to-door service with import duty paid by NoiseMeters is available. There is an extra charge for this service to cover the duty so please contact us for more details. If you want more information about any import duty then please contact your Customs Office. The Harmonized Tariff Code for a sound level meter is 902780. For more information on buying a sound level meter or noise dosimeter in Ghana, please contact sales@gh.noisemeters.com. The company Noise Meters Limited does not operate through local sound level meter distributors in India as we prefer to ship the products directly to your address by FedEx, DHL or EMS at a very low cost. The prices for all our products are shown in US Dollars. You can get them in British Pounds (GBP) or in Euros by following "Noise Meters UK" or the "Noise Meters in Europe" links at the top of this page. Payment can be by Credit Card (VISA or MasterCard), bank transfer or by cheque. Most of our sound level meters and noise warning signs ship to India under the HS Tariff Code 902780 17. Please call your local Indian Customs Office for information on any import duty that may have to be paid. Noise Meters usually ships by FedEx or DHL, although some of the lower cost sound level meters and accessories are shipped by EMS. We can use other companies at your request. If you have your own account with FedEx, DHL, or similar then we can ship on your account. Products that are in stock will usually be delivered within 5 days (FedEx) or 14 days (EMS). Please visit the Delivery Charges page for more information. For more information, please contact the export manager, Mr Andrew Snell, on export@noisemeters.com. NoiseMeters Limited is a British company, based in the North of England, supplying sound level meters and noise dosemeters (like the popular doseBadge) to Ireland and Northern Ireland. Most of the products offered on the noisemeters.co.uk (prices in Pounds) and noisemeters.ie (prices in Euro) web site are manufactured in the UK. Those that are manufactured elsewhere are held in stock at our UK offices so we can offer quick delivery to Ireland. Delivery to Ireland is usually by 48-hour courier service, unless otherwise state on the web page. Quicker delivery can sometimes be achieved but 48-hour is the usual. The basic delivery charges can be seen on the Delivery Prices page. Republic of Ireland - For VAT registered companies, VAT is charged at 0% in line with EU regulations. For non-VAT registered entities it is charged at the UK rate of 20%. If you have any questions about working with NoiseMeters then please contact our UK office on +44 845 680 0312. NoiseMeters ships sound level meters and noise dosimeters directly to customers in Malaysia and surrounding regions. The meters are usually shipped directly from the UK by FedEx or EMS. The basic delivery charges can be seen on our Delivery Charges page. Most of our sound level meters and noise warning signs ship to Malaysia under the HS Tariff Code 902780 17. Please call your local Malaysian Customs Office for information on any import duty that may have to be paid. Noise Meters Limited supplies sound level meters and noise dosimeters directly to customers and distributors in the UAE, shipping door to door usually by FedEx or DHL for quick delivery or by EMS for reduced cost. With a number of customers in Dubai and Abu Dhabi we have plenty of experience of exporting to your part of the world. The prices on the main website are all in US Dollars. They are also available in British Pounds or Euros by following the NoiseMeters UK and NoiseMeters in Europe links at the top of this page. The prices do not include delivery (see below). Payment can be made by credit card, check or bank transfer. The full list of delivery charges can be seen on the Delivery Charges page. When shipped by FedEx or DHL, the charge for a Sound Level Meter is $82 and for a Noise Measurement Kit (meter, calibrator, carrying case, etc.) is $98. Shipping by EMS of the lower cost sound level meters, such as the NM102, is just $41. If you want more information about any import duty then please contact your Customs Office. The Harmonized Tariff Code for a sound level meter is 902780 17. For more information on buying a sound level meter or noise dosimeter in the United Arab Emirates, UAE, please contact the Export Sales Manager, Mr Andrew Snell, at export@noisemeters.com. NoiseMeters Limited is a British company with offices in Surrey and North Yorkshire. Most of the products we supply are manufactured in the UK or elsewhere in Europe, with one or two products from the far east. NoiseMeters Inc is a US company, registered in Texas and Michigan, with its main office in Berkley, Michigan. We supply sound level meters to all states and overseas territories.